Year after year, so much emphasis has been put on the anniversary of the original Sonic the Hedgehog game and its star and yet very rarely is Doctor Eggman given equal time in the spotlight. Just look at the upcoming event in July, Sonic’s name is in the title and the logo, the celebratory silver coin features only Sonic and even past anniversaries including 10, 15 and the 20th have only depicted Sonic. But I would argue that the original Sonic the Hedgehog wasn’t just a success due to Sonic and his unique gameplay, but also because Doctor Eggman was such a strong villain and ended up becoming a strong character. 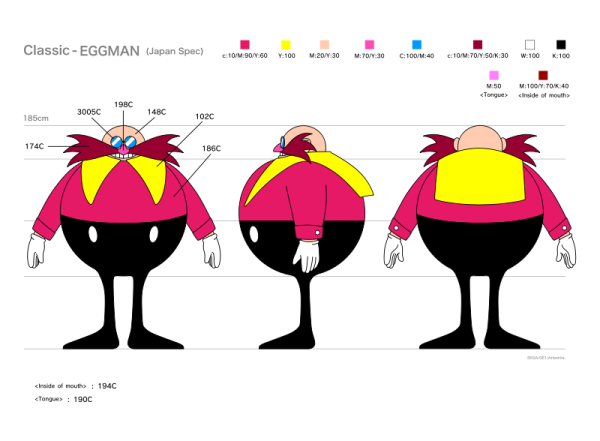 Eggman’s success in the West was largely helped by how he was reshaped by SEGA of America, which saw the character renamed Doctor Robotnik and an emphasis was put on his short fuse and over-the-top hatred of Sonic. Robotnik’s character was later expanded in several forms of media, including both 1993 cartoons “Adventures of Sonic the Hedgehog” and the Saturday morning “Sonic the Hedgehog” as well as Archie’s comic book series. While Sonic remained true to the same “cool dude” persona in all forms of media, no doubt because SEGA licensing wanted to keep their mascot on a short leash, cartoon and comic book creators were given far more leeway when it came to Robotnik. “Adventures of Sonic the Hedgehog” presented the Doctor as a revenge obsessed maniac who was far too in love with himself, while the Saturday morning cartoon depicted him as more of an evil Darth Vader-like villain. Archie Comics depicted a combination of the two animated Robotniks and, in later years, expanded the character’s back story. I’d argue that Eggman/Robotnik has grown to become a fan favorite character, often eclipsing the franchise’s star. The Sonic series is, by and large, a single player experience. 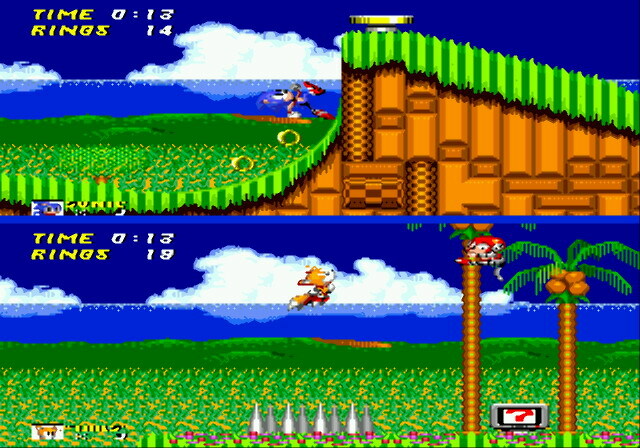 But thanks to Sonic the Hedgehog 2, we got a taste of two-player Sonic by way of the game’s 2 Player Vs. mode. While the mode was in no way needed, given the single player mode was so robust and such an excellent experience on its own, it was a welcome inclusion. Often, when it came to 90s platformers, when you had a friend over you would either have to trade off the controller between levels or play a 2 Player mode that essentially had the two of you playing your own single player experiences alternating between deaths. Thanks to Sonic the Hedgehog 2, you could actually compete in races with your friends in the same level. Sure the stage selection was limited and the screens were squashed, but Sonic the Hedgehog 2‘s 2 Player Vs. mode was such a fun mode that often hours were spent playing those same few stages. Later Sonic games, including Sonic the Hedgehog 3, Sonic Rivals and Sonic Colors, carried on the 2 Player Vs. mode tradition, but Sonic the Hedgehog 2 was where it all started. 1993 was a huge year for the Sonic franchise. While fans patiently awaited Sonic the Hedgehog 3 and grumbled at the fact that their parents wouldn’t buy them a SEGA CD so they could play that one new Sonic game, Sonic as a franchise was expanding to other forms of media. I can’t stress enough how big a deal it was for Sonic to have two cartoon shows and a comic book series. While in today’s world, fans are wrapped up in what it canon and in what part of the world things are produced, back in 1993 everything Sonic was canon in our minds and little attention was paid to Japanese output versus Western output. The first two video games only scratched the surface of Sonic’s world, so thanks to the comic books and tv shows we finally saw characters interacting, we learned more about Sonic’s friends, and even got a few clues to the origins of both Sonic and Robotnik’s feud. The original Archie Comics’ Sonic the Hedgehog mini-series kicked off in November of 1992 with issue 0, followed by issue 1 in December of 1992 and issues 2 and 3 in the winter of 1993. It was in these comics that fans got their first glimpse of the Saturday morning cartoon series cast as well as characters from the far more cartoonish and humorous “Adventures of Sonic the Hedgehog”. 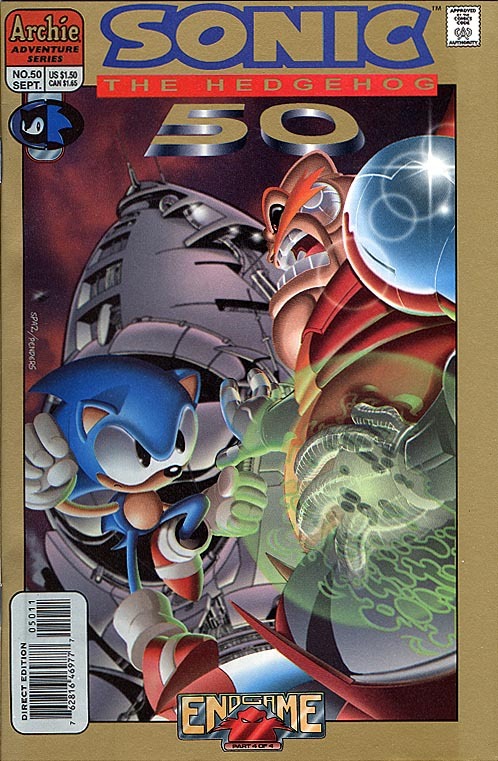 The original mini-series also saw references to early Sonic games and even gave fans an origin story with issue 0’s bizarrely named “Oh No–Robo! No-Mo’ Mobo!”. Looking back, Archie was clearly playing fast and loose with the continuities of several sources, but to fans in 1993 it was all a bridge between the different Sonic stories being played out in video games and on television. If 1993 was a huge year for Sonic, 1994 was huger than huge. With the year bookended by the two biggest and best games the franchise has ever seen, Sonic fans were more than satisfied. But SEGA didn’t stop at games, as we also saw a Happy Meal promotion, the ongoing series from Archie Comics and a second season to the acclaimed Saturday morning cartoon. As a kid, I was far more of an “Adventures of Sonic the Hedgehog” fan, but I knew that there was a lot more to the Saturday morning incarnation of the series. While most fans see the second season of “Sonic the Hedgehog” as a step down from the first, due to ABC asking the series creators to tone down the dark aspects and feature more humor, I felt that the retooled show was more in line with the spirit of Sonic the Hedgehog. Season 2 introduced The Void and Project Doomsday, two ominous plot devises that played out over several episodes and kept viewers coming back just to see what these two things were all about. The season ended with an excellent finale which features a bit of closure and a major tease that never was answered due to the series not returning for a third season. Like many Genesis owners, I had never experienced owning the SEGA CD and 32X at the time of the add-ons’ debuts, which is a shame because I missed out on playing some real Sonic gems. While pretending I loved Sonic Spinball, the far too expensive SEGA 32X featured Knuckles the Echidna in his first – and so far only – spin-off game. 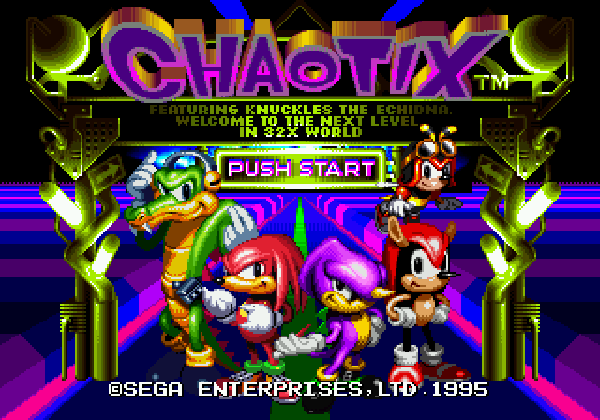 However it wasn’t the gameplay or Knuckles in a starring role that drew my attention, it was the mysterious new team known as The Chaotix. While Sonic had Tails as his sidekick, Knuckles one-upped the blue hedgehog by having a diverse team of cool looking characters. What more, you could actually play as all of them in the game and each had their own ability! I’m speaking mainly for myself on this one, but I’m sure several fans can relate, that Chaotix was largely experienced on the sidelines through adverts and the rare magazine article. As such the Chaotix, as both a game and team of characters, had this elusive allure causing any associated content to be marked as “must consume”. That same year, Archie Comics released a loose adaptation of the game in a one shot comic [which you can read all about in David the Lurker’s excellent Sonic Retro write-up] and later gave the characters supporting status in an ongoing Knuckles the Echidna comic. Sonic’s friends tend to get the short end of the stick on the internet, but I refuse to dislike a crocodile wearing headphones and a purple chameleon. While over in the West, Sonic fans were trying to figure out why Sonic was starring in the sequel to Flicky, the Japanese fans were spoiled rotten with some of the greatest Sonic the Hedgehog animation by way of the “Sonic the Hedgehog” OVA (Original Video Animation). Released in two parts to VHS, “Welcome to Eggmanland” and “Sonic VS Metal Sonic! !” placed familiar Sonic the Hedgehog characters in a setting that was very different from what was seen in both the games and Western produced tv shows and comics. Rather than having just one floating island, the OVA featured a whole system of floating islands known as the Land of the Sky, which hovered above the dark and desolate Planet Freedom aka the Land of Darkness which was home to ruins (which resembled abandoned modern cities) and Eggmanland. 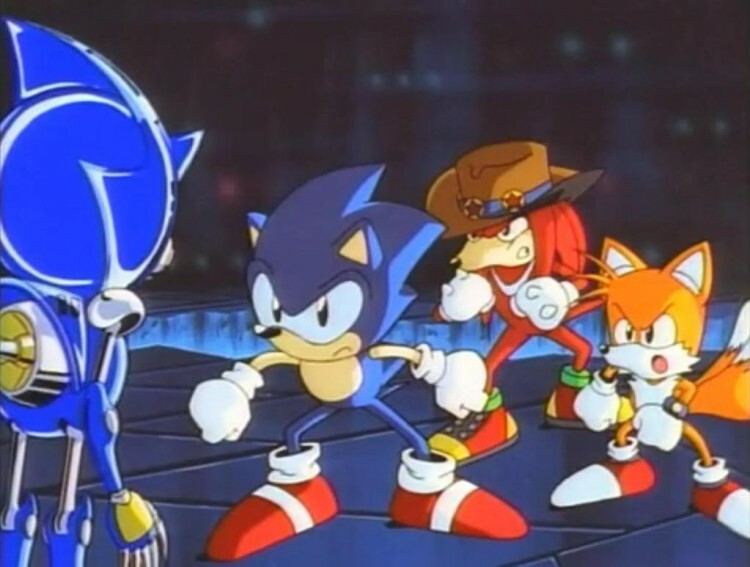 The “Sonic the Hedgehog” OVA didn’t make its way to the West until 1999, but it is clearly a product of 1996. new characters like Knuckles, who had yet to be fully fleshed out as a character, was depicted as a wandering treasure hunter. Sonic, Tails, Metal Sonic and Eggman were similar to their game counterparts, but the divided lands of Sky and Darkness were such a radically different setting from the games that they gave the OVA its own look and feel despite the familiar faces. 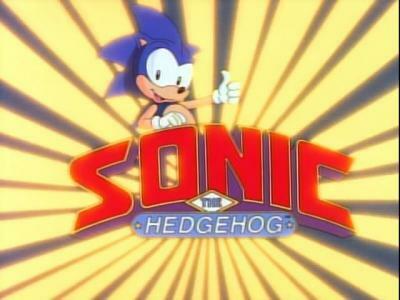 Upon seeing the OVA when it came West in 1999, retitled “Sonic the Movie”, fans were even more confused thanks to the three year gap between release and localization and the fact that SEGA also had three other Sonic storylines running: Archie Comics’ Sonic the Hedgehog, “Sonic Underground” and Sonic Adventure. To this day, the Sonic the Hedgehog OVA remains one of the best animated depictions of Sonic, featuring great action, thrilling fights and a catchy soundtrack. While the games always reset the status quo after each time Sonic defeated Eggman, Archie’s Sonic the Hedgehog comics dared to do the unthinkable and actually kill off Doctor Robotnik. While the Sonic the Hedgehog comics started as a humorous take on the games and tv shows, soon the series shifted gears and began to tell multi-issue arcs and became darker to match the Saturday morning series. Following the cancellation of the tv series, the comics acted as a quasi-continuation by keeping the spirit of the Saturday show, as well as many of its characters, alive. However after 40+ issues (not including one shots, spin-offs and specials) head writer Ken Penders decided to kill Robotnik off once and for all with the End Game arc. From issues 47 to 49, an incredibly dark story unfolded where Sonic was framed for the death of Sally Acorn which lead to the final confrontation between Sonic and Doctor Robotnik in issue #50. Following an epic battle, Robotnik was vaporized by his own weapon and was actually dead! That is, until issue #108 where he temporarily returned but then he died again. Also of note, the writers did find a way to revive Robotnik and have him be reborn as Eggman through a convoluted explanation of alternate universes and robot bodies turned flesh, but as far as the real Julian Kintobor aka Doctor Ivo Robotnik, he was well and truly dead. The issue was such a huge deal that Archie gave it the gold inked cover treatment and later released a Director’s Cut special of the story. This is a quickie and more of an unknown moment than an underrated moment, but is definitely worth noting. In 1998, trademark law was revised to include three dimensional shapes for products and objects. 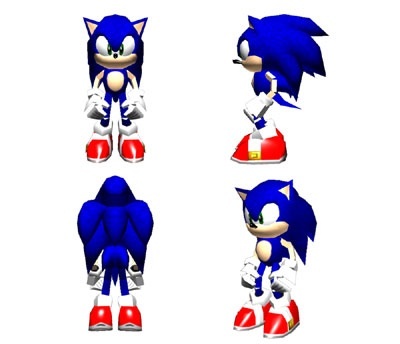 When SEGA caught wind of this revision, they were quick to trademark the 3D representation of their mascot and as such, Sonic was one of the very first fictional characters to have his full shape trademarked! 1999 was another major year for Sonic. While Japan had seen Sonic Adventure‘s release in 1998, Americans were hotly anticipating the US release of the game and the launch of SEGA’s brand new console the SEGA Dreamcast. Following 9/9/99, there released another Sonic title that didn’t have anywhere near the amount of fanfare that Sonic Adventure had, and that game was Sonic Pocket Adventure for the Neo Geo Pocket Color. 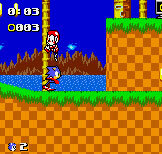 Marketed as a quasi-accompaniment to Sonic Adventure, Sonic Pocket Adventure placed the newly redesigned green-eyed Sonic in the familiar 2D world of the Genesis classics – specifically Sonic the Hedgehog 2. Featuring stages largely influenced by the Genesis sequel as well as elements of the original and remixed music from Sonic the Hedgehog 3 & Knuckles, Sonic Pocket Adventure didn’t bring much newness to the table. Still, when you are pulling from such great games for inspiration, you really can’t go wrong. 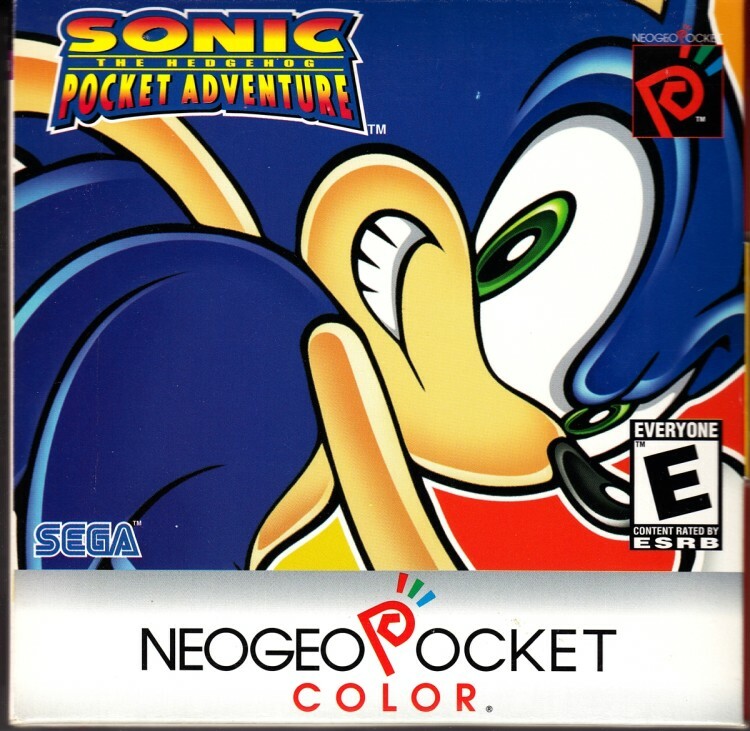 Sonic Pocket Adventure was loved by critics and fans alike, though given how few people actually owned a Neo Geo Pocket Color, the game didn’t see nearly as much attention as it deserved. Sonic fans can be really annoying when it comes to accepting other SEGA franchises. Trust me, I was such a fan for a good seven years. My SEGA Genesis wasn’t so much a SEGA machine as it was a Sonic machine. While I did play several SEGA classics between 1991 and 1998, I was largely devoted to the Sonic franchise. Thankfully SEGA were churning out more than enough Sonic titles to keep me satisfied, but I cannot imagine how awful I would be in 2016 during SEGA’s E3 stream in which they showed off the impressive Warhammer 40,000: Dawn of War III and Yakuza 0. Following both the YouTube chat and the Twitter reaction, Sonic fans were doing nothing but passing over two great looking games because they didn’t include a blue hedgehog. It was annoying, but I could relate. Back in 2001 I was opening myself up to other SEGA franchises, discovering the awesomeness that was Jet Set Radio and Shenmue. However, JRPGs were not a genre I was into and it would take a lot to get me to buy such a game on release. 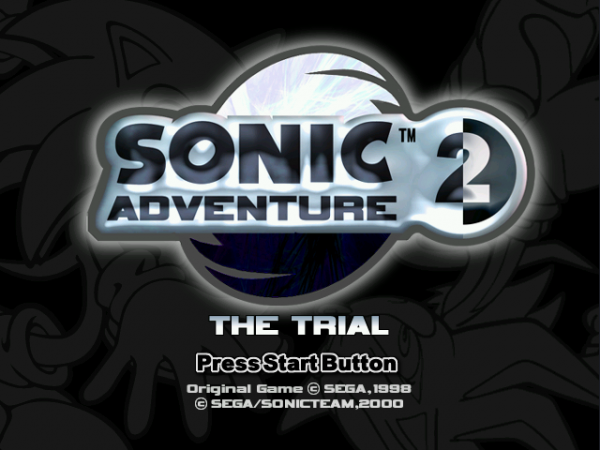 Enter Sonic Adventure 2: The Trial. Exclusively bundled with Phantasy Star Online, buying SEGA’s new online RPG was the only way Sonic fans could get a taste of the hotly anticipated sequel. While I was already onboard the Phantasy Star Online bandwagon, thanks in large part to the articles in the Official Dreamcast Magazine, Sonic Adventure 2: The Trial sealed the deal that I’d be a first day buyer. I can only imagine how many copies of Phantasy Star Online the trial disc moved, and how many Phantasy Star Online fans were created in the process. As an added bonus, Phantasy Star Online was chock full of Sonic Team references thanks to the team creating both games. Sonic Advance is by no means an underrated moment in Sonic history. Fans often point to is as one of their favorite handheld games, and for good reason. It is an all around solid 2D Sonic title which reigned in Sonic’s friends to the core four of Sonic, Tails, Knuckles and Amy and the game doesn’t rely on that pesky homing attack. But there is one specific aspect of the game that I wanted to highlight, and that is Amy Rose. 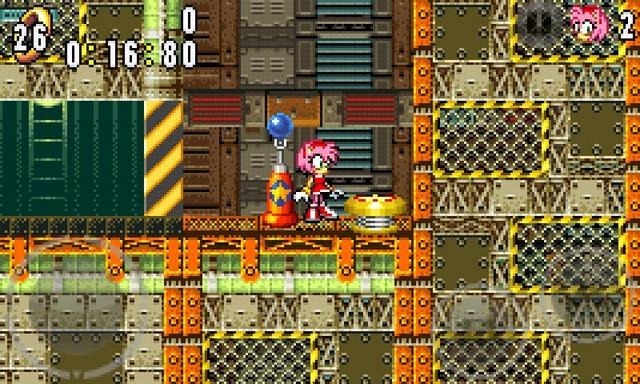 Prior to her appearance in Sonic Advance, Amy was either an NPC or a drastically slowed down single player experience. Sonic Adventure 2 did feature Amy in the 2 Player mode, but she was basically a reskinned Sonic. Sonic Advance featured Amy Rose as a fully playable 2D character, featuring her own move set based around her hammer attack. No more was Amy run walking or acting as a reskinned Sonic, she was her own speedy character able to stand toe-to-toe with the classic trio. What more, Sonic Advance was the game that really nailed Amy’s status as just another member of the team, carrying forward into the future Sonic Advance series titles and other spin-offs including Sonic Riders and the Sonic Boom brand. The anime “Sonic X” isn’t incredibly popular with fans, but if the casting of Mike Pollock as Doctor Eggman is the one great thing to come out of the show then “Sonic X” may just secretly be the greatest thing to happen to the Sonic brand in the early 2000s. I mentioned way back in my 1991 selection how great a character Doctor Robotnik was in the various TV shows and comics. I resisted mentioning the video games because outside a few comedic moments of running away, Doctor Eggman really didn’t do that much in the original Genesis classics. He laughed, he got mad, he battled you, he got scared and he ran away. While adding dialogue to the games is a moment many fans point to as being when the quality began to suffer, I’d say dialogue is what really brought the Doctor Eggman of the games to life. Deem Bristow did an excellent job in the early years of voice acted Sonic games, but Mike Pollock elevated the character and made it his own thanks to his beginnings on “Sonic X”. Unlike a video game, “Sonic X” gave Mike hours of screen time to make the character his own – at least as much as dubbing a Japanese anime allows. 2005 saw Mike become the full time video game voice actor for the evil Doctor with Shadow the Hedgehog, and games like Sonic Unleashed, Sonic Colors and Sonic Generations allowed for an improved performance thanks to better writing. 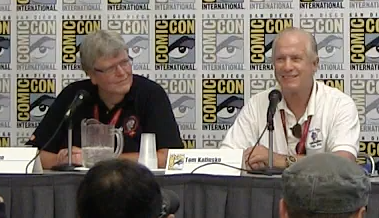 2010 saw SEGA recasting the Sonic series all over again, but Mike Pollock remained as the voice of Doctor Eggman, much to the delight of fans. 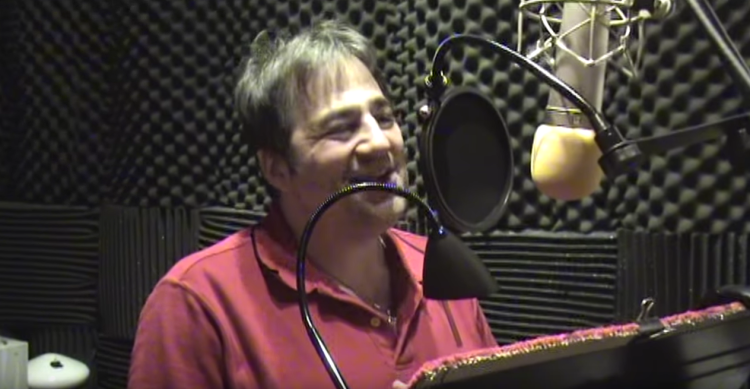 Mike continues to voice Eggman in the video games and has earned the distinction of voicing the most versions of the character for the longest amount of time (“Sonic X” Eggman, Eggman, Classic Eggman in Generations and Sonic Boom Eggman). 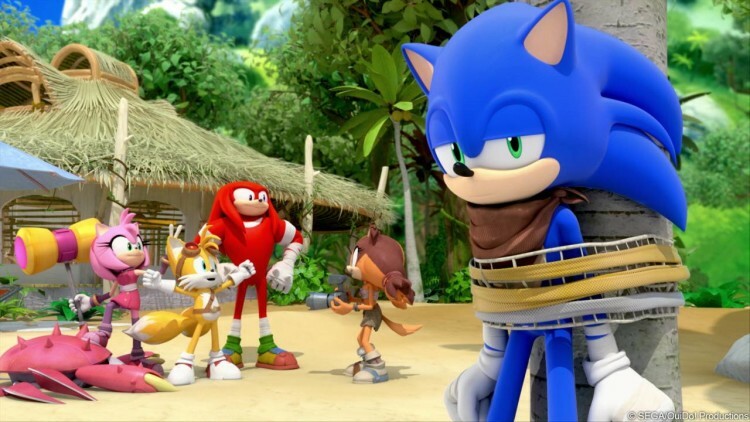 Mike’s latest take on the character in “Sonic Boom” has allowed much more freedom to have fun with the character, and in turn Mike has made Eggman the star of a Sonic tv series. Having met Mike twice, I have to say that the guy is incredibly nice and deserves nothing but the best for his hard work in the industry. 2005 was a murky period for the franchise. The Archie Comics series was in a rut as Ken Penders twisted the series into less of a comic for Sonic fans and more of a platform for his own bizarre characters and plots. Sonic’s TV presence was non-existent as Sonic X had ended the year prior. The games were more miss than hit, with the only real bright spots being re-releases of the Genesis titles. So it isn’t impossible to believe that there was a time when people were optimistic about Sonic the Hedgehog (2006). 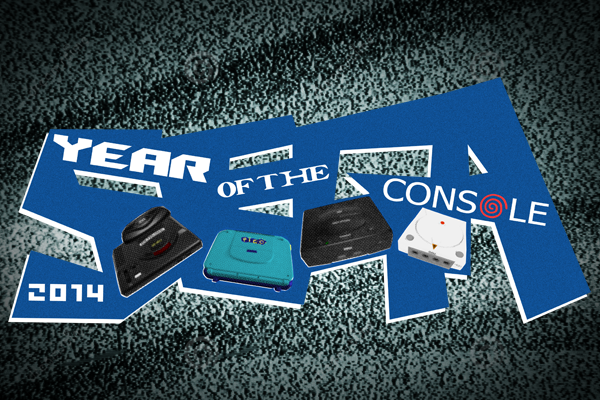 With the Xbox 360 soon to be released and the Playstation 3 on the horizon, gamers were ready to see that the SEGA could bring to the next generation of game consoles. 2005’s E3 teased the gaming press with a first look at Sonic the Hedgehog’s 15th anniversary game in a behind closed doors presentation, and when the video leaked to the internet fans were thrown into a frenzy and speculation ran wild. Sonic was in his most realistic setting yet, and the appearance of wide open fields and large castles hinted at the possibility of the return of open environments. The new robots looked cool, and it was great to see Eggman’s Egg Carrier making a return. In hindsight, the teaser was a bit of a bait and switch and the hyper realism was just one of the completed game’s weaknesses, but at the time it was fun to be intrigued and excited for a next gen Sonic game. 2006 was a terrible year for the franchise. Between the abysmal Sonic the Hedgehog 2006 and the disappointing Sonic Rivals and Sonic Riders spin-offs, there wasn’t much to enjoy as a Sonic fan – though it should be noted that Ian Flynn took over the Archie Comics’ Sonic series and slowly transformed the book into something great. Still, as bad as Sonic the Hedgehog 2006 was, there was one aspect of it that was enjoyable and that was the soundtrack. Featuring a plethora or talented SEGA and Sonic composers, including Tomoya Ohtani, Mariko Nanba, Hideaki Kobayashi, Takahito Eguchi, Jun Senoue and Seirou Okamoto, the soundtrack stayed true to the music stylings of past games while bringing new styles of music into the franchise. While I would never ask anybody to play Sonic the Hedgehog 2006, I highly recommend the soundtrack. Though… skip “Dreams of an Absolution”. Here in 2016, physical media for old TV shows is sadly on the way out. Even new Sonic TV content, like “Sonic Boom”, isn’t being given the DVD treatment in America. But back in 2007, the excellent Shout Factory (the successor to the equally excellent Rhino Records) took a chance on the 90s Sonic cartoons and released the complete Saturday morning “Sonic the Hedgehog” TV series as well as the first volumes of “Adventures of Sonic the Hedgehog” and “Sonic Underground”. On top of including the episodes, Shout Factory also included cool bonus features which placed various show creatives in front of the camera to discuss their involvement in the series. Following the 2007 releases, “Sonic Underground” was wrapped up with a second volume in 2008 and “Adventures of Sonic the Hedgehog” saw volume two released in 2008 followed by volume three in 2010 which was an online exclusive. I’m a sucker for Sonic action figures, especially figures of characters who rarely – if ever – receive merchandise and look insanely cool. So it wasn’t difficult for me to choose a 2009 pick because I remember being ecstatic that Metal Sonic was not only receiving an action figure, but that it was going to be 10″ tall. Jazwares, who held the license for Sonic figures before TOMY picked it up, was very hit or miss on the quality assurance side of things with bad paint jobs and flimsy joints. But when they hit the mark, they were awesome. Figures like Big the Cat and Froggy and the Classic Sonic line are still some of the best Sonic the Hedgehog figures out there, and the 10″ Metal Sonic was also among some of Jazwares best Sonic products. 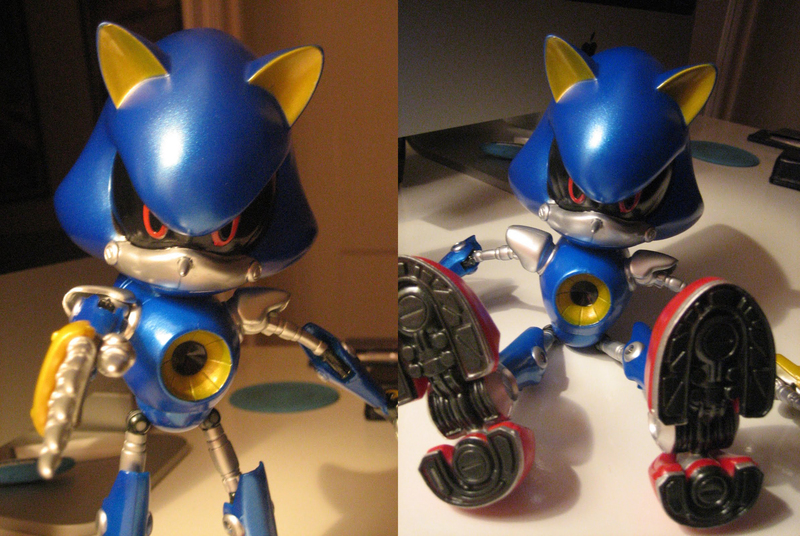 Later iterations of the figure would fix the shoes, which were lacking a white stripe, but all-in-all 10″ Metal Sonic was a very cool, and highly affordable, piece of Sonic merchandise. Like Sonic the Hedgehog 2‘s 2 Player Vs mode, Sonic Colors‘ ‘Sonic Simulator’ deserves far more attention than it has received. 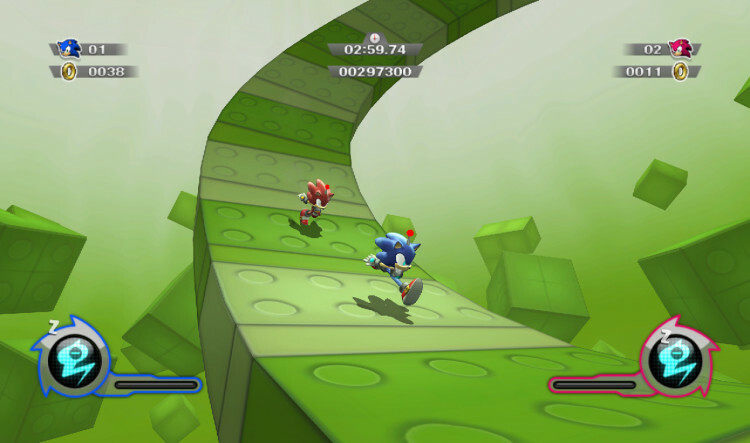 The optional bonus mode features Game Land, a series of 21 bonus stages taking place inside a mechanical planet shaped like Sonic’s head, dubbed the ‘Sonic Simulator’. Inside, players control multi-colored robotic Sonics who were, presumably, built by Doctor Eggman as guinea pigs for his virtual world. Outside of giving the game more content and awarding Chaos Emeralnds, the ‘Sonic Simulator’ allowed for multiplayer races through the various stages and even allowed you to stick your Mii’s head on a Sonic body. Stage’s featured 8-bit inspired compositions of Sonic Colors‘ main game stage music and some layouts referenced classic layouts from the original Sonic the Hedgehog (a fact that we were the first to report on). If you happen to have some friends over, why not celebrate Sonic’s 25th with some ‘Sonic Simulator’? Despite the aforementioned hit or miss quality of Jazwares figures, in the company’s final years as a Sonic license holder they really did clean up their act for the most part and released some really cool toys. Perhaps their best was in celebration of Sonic’s 20th anniversary, the company released a line of figures featuring special packaging and cool new accessories by way of classic enemies. 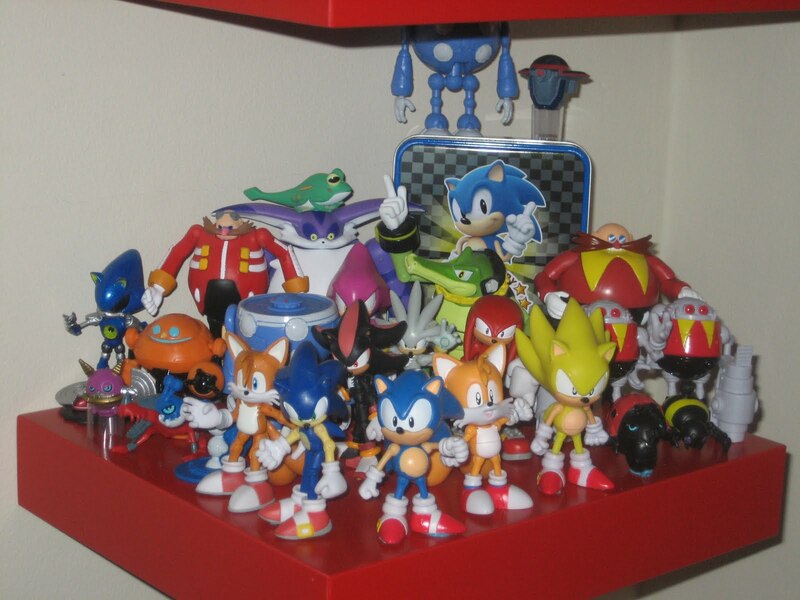 Highlighting important moments in the franchise’s history, fans saw figures like classic Sonic and a Motobug in special 1991 Sonic the Hedgehog packaging, Knuckles and an Egg Pawn in special 2003 Sonic Heroes packaging and Doctor Eggman and two Egg Robos in special 1994 Sonic the Hedgehog 3 & Knuckles packaging. Despite a few goofs, mainly getting a release year wrong and misspelling an enemy name, it was a solid collection that was well worth owning. 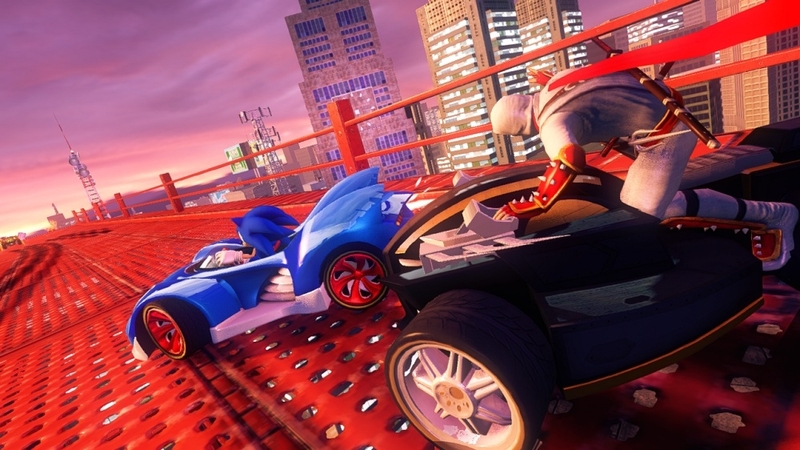 It’s debatable if Sumo Digital’s Sonic & All-Stars Racing Transformed itself is underrated. The game received high scores, was praised by fans for being a huge step up from the last game and eventually became available on nearly every platform under the Sun. However I do think that gamers forget just how great the game is, especially when compared to Mario Kart 7 which released a little under a year before on the Nintendo 3DS. I’ll admit, Mario Kart 7 is a solid game, but I thought it just played things too safe. It has almost become a theme with the Mario series that rather than take risks, they stick to what works even when entering the sixth sequel in a series. Mario Kart 7 featured the ability to traverse by land, sea and air, but in my opinion Sonic & All-Stars Racing Transformed went above and beyond and actually delivered on such a gameplay component. Not only did vehicles fully transform, rather than simply spouting a hang glider and propellor, but they also controlled differently depending on the vehicle mode. Driving felt like a solid racer, thanks to the work of former Bizarre Creations developers who had previously worked on Blur. Flying featured arcade-style flight controls, and boat racing was like something out of Hydro Thunder. The game was not perfect, there were the rare but annoying glitches caused by the varied gameplay, but Sumo Digital did an admirable job in maintaining SEGA’s spirit of innovative game design and striving to one up Nintendo. 2013 saw the release of Sonic the Hedgehog and Sonic the Hedgehog 2 remastered for iOS and Android, two excellent pixel-perfect remakes of the original SEGA Genesis classics by fan game turned official developers Taxman and Stealth. The remakes launched to little fanfare on SEGA’s end, but the fanbase exploded when they learned of all the little secrets contained within the mobile games. The team snuck little secrets like elemental shields from Sonic 3 & Knuckles, and the free rolling wrecking ball and Sonic’s scrapped scuba mask from Sonic the Hedgehog. There were even the Marble Zone’s UFOs that were only seen in beta screen shots! But the biggest of all surprises was the return of Sonic the Hedgehog 2‘s Hidden Palace Zone. 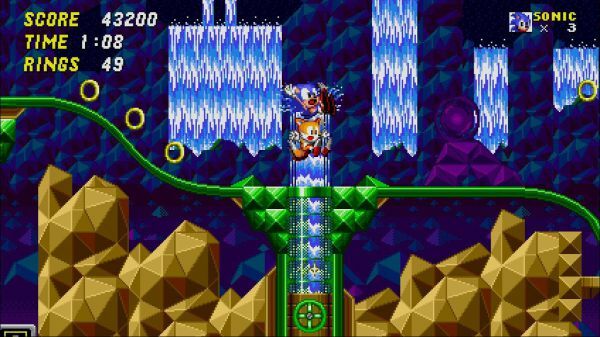 In the original version of Sonic the Hedgehog 2, Mystic Cave Zone featured an infamous inescapable spike pit. But Taxman and Stealth remedied that by removing the pit and replacing it with a transition to the once lost Hidden Palace Zone stage. Using original assets and sprites, including some familiar locations seen in screenshots, the team created a whole new layout to explore complete with Hidden Palace Zone specific enemies. The inclusion of the long lost zone was a huge deal to die hard fans, but given the game itself was only on mobile platforms and the fact that general audiences likely didn’t know what Hidden Palace Zone even was, it is a worthy mention on this list. Let’s hope we haven’t seen the last of Taxman and Stealth, as it would be great to see them tackle Sonic 3 & Knuckles or something else. Like Jeb Bush’s failed presidential campaign, 2014 for Sonic fans was a mess. SEGA of America made a huge gamble with the Sonic brand by betting it all on the Sonic Boom spin-off franchise. Unlike past Western efforts to make Sonic content, Sonic Boom was more than simply a spin-off game from the main series or a TV series. It was a multimedia effort eyeing to conquer animation, comic books, games and merchandise. Now, in 2016, the merchandise has dried up, the comic books are cancelled, and the games are on their last legs with the upcoming and long delayed Sonic Boom: Fire & Ice. The onc aspect to the whole Sonic Boom brand that seems to still be thriving is the tv series, which is in production on a second season. The first season of Sonic Boom isn’t the pinnacle of Sonic TV animation, but it is a very good series. The CG animation looks slick, the writing is both funny and self aware and the voice acting is excellent thanks to SEGA reusing the voice actors from the games and allowing them more freedom to have fun with the characters. Now that we’ve settled into a world where Sonic Boom isn’t SEGA’s main focus anymore and there is no fear of it overtaking the main Sonic brand, I feel that there is a lot less tension associated with the Sonic Boom brand. It’s now just that goofy funny Sonic TV series that, maybe, it should have just been all along. 2015 was a year of transition for SEGA. SEGA of America underwent major changes, with several longtime staffers leaving and new faces joining the company as they made the transition from San Francisco to Irvine and Burbank. As a fan site, we were both excited for the future and unsure of how we would build bridges with the new staff. During an interview with Sam Mullen, who stuck with SEGA through the transition and is a localization producer, a former SEGA employee crashed the interview and gave us a quick hello. Aaron Webber started with SEGA in 2008 as a Game Master for Phantasy Star Universe and transitioned to an Assistant Community Manager before becoming an Associate Brand Manager responsible for marketing and brand growth for IPs that included Sonic the Hedgehog. And then… Aaron left. We weren’t exactly sure why, and I won’t speculate, but it is worth noting that shortly after Aaron’s departure the Sonic Boom announcement came. After the rise and fall of Sonic Boom, and the announcement of SEGA’s move, Aaron came out of hiding and made appearances at SEGA’s offices. Soon, it was announced that Aaron was returning to SEGA of America and would be in charge of Sonic the Hedgehog’s social media and PR. Right out of the gate, Aaron reinvigorated the Sonic brand on social media through a deep knowledge of the franchise and a whole lot of humor. Aaron’s return was no doubt the best thing to happen to the brand in 2015 and we are so happy to have him back. 2016 has been fairly quiet, despite being the 25th anniversary, but there has been rumblings that a new Sonic game will be announced at the Sonic 25th Anniversary Party on July 22nd in San Diego. 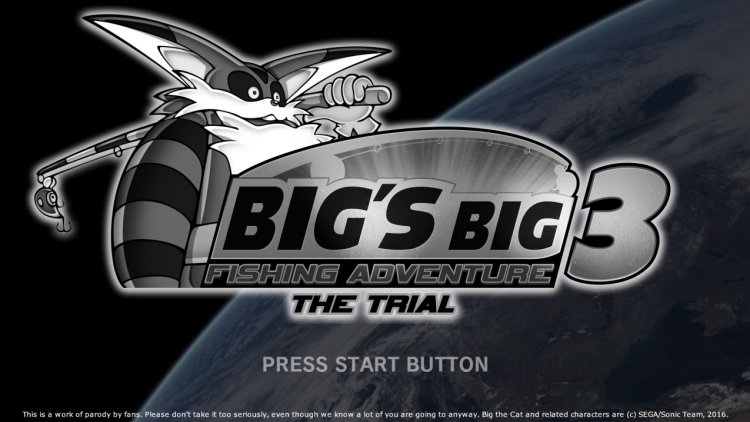 Meanwhile, we have the fan made and approved by SEGA browser game Big’s Big Fishing Adventure 3 to look forward to. On April 1st, a trial version of the game went live at bigthec.at and several fans thought that was it. But no, I can tell you that the game is real and man oh man will it be worth the wait. I won’t say much more, because Big brother is watching me (Spoiler: Big’s my brother). 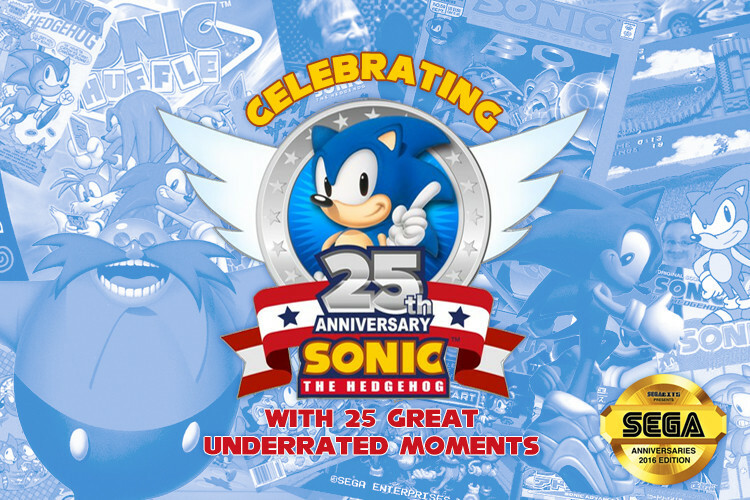 So there we have it, 25 years of underrated moments in Sonic history! Have your own favorite underrated Sonic moments to share? Sound off in the comments below. Happy anniversary, Sonic the Hedgehog! Can’t really tell you how great of a read this was. Read from top to bottom, never a dull moment. Aaron coming back last year was definitely a surprise to me and I was overjoyed. Still happy the best guy to run Sonic PR is doing it, had no idea he’d be such a great social media manager. But, Happy Birthday Sonic! Let’s hope it’s a great one, and even if for some reason it isn’t, 25 is a huge milestone. Now if they would just release Sonic 3 HD Android I’ll be happy. I remember the first time I found out Japanese name for Dr. Robotnik was Eggman. It was when I watched “Sonic the Hedgehog” OVA (Japanese version with English sub). I knew something was up as a kid when I kept seeing the word egg in the Genesis games, but didn’t quite get it until 1999 when the movie released and Sonic Adventure’s JP language track said Eggman while the subs said Robotnik.